Visiting Quebec City in winter doesn’t mean you have to stay indoors. 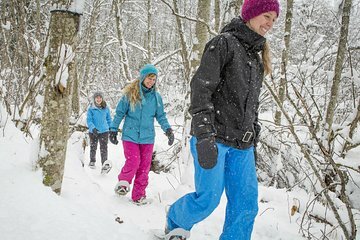 Get out and have some fun on this snowshoeing adventure in the Jacques-Cartier National Park. Explore the forest, look out for wildlife, learn about the area from your local guide, and get the chance to take beautiful winter photos. Stop at a heated tent for lunch and a refreshing hot drink. This is a fun trip for active travelers.